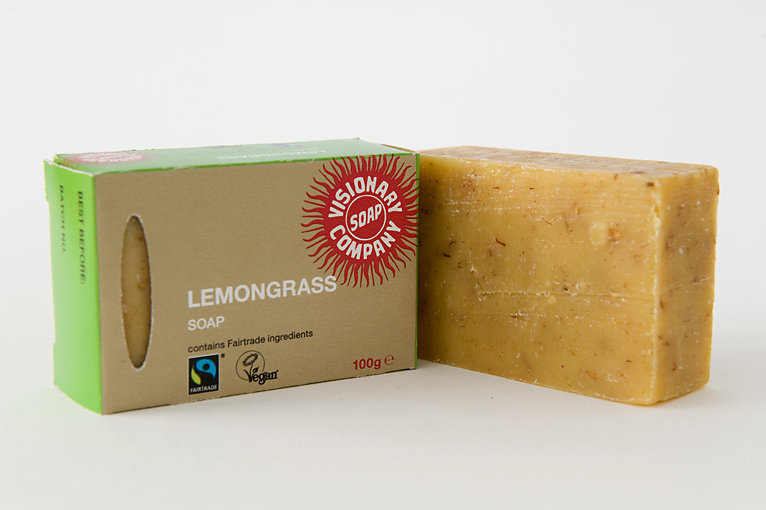 Visionary Soap is the UK’s leading fair trade body care company whose whole range carries the FAIRTRADE Mark. They produce a whole range of products, not just soaps, all of which contain a high percentage of fairtrade ingredients. To be classed as fairtrade, soaps need to contain a minimum of just 2%, which I was really surprised about! Yet Visionary Soap strive to ensure as many of their ingredients as possible are fairtrade. Their soaps, on average, contain 60% Fairtrade ingredients, body butters – 99 to 100%, lip balms - 34%, body oils - 19% and gardener’s hand salve – 34%. The Visionary Soap Company kindly sent me some of their products to try - two soaps, a lip balm and a hand salve. In this post I will be concentrating on the soaps, and will review the other products later in a different post. The two soaps I was sent are Lemongrass and Geranium Rose. 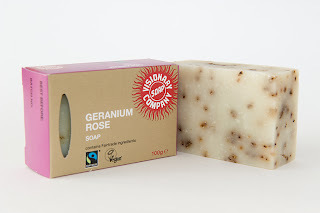 I've decided to be very kind to my followers and offer the Geranium Rose soap as a prize for a competition, which will be later in this post. The scent of the Lemongrass is absolutely gorgeous - really fresh and invigorating. It smells really natural, no nasty chemical smells here! The soap is quite soft and lathers up nicely in warm water, ideal for the bath or shower. I've got sensitive skin and find alot of soaps harsh, but this was lovely and gentle on my skin. It has lasted really well too. I think this is a great product and would definately recommend this company. At £3.25 for a 100g bar it's great value. There are eight different scented soaps in the range, plus an unscented soap if you prefer. Click on the link above to see the Organic Soaps range. (Should have mentioned in last post I already follow you on twitter). Am following you on GFC & have liked Visionary Soap on FB. Following this blog using Google Friends Connect as M.
I've followed and liked - thanks! Following on GFC (Jules) and like the Visionary Soap Company on FB. Have tweeted about your blog http://twitter.com/#!/julescomps/status/115435216750919680. have liked on fb, twitter and also i joined your blog on GFC. please enter me for the competition.